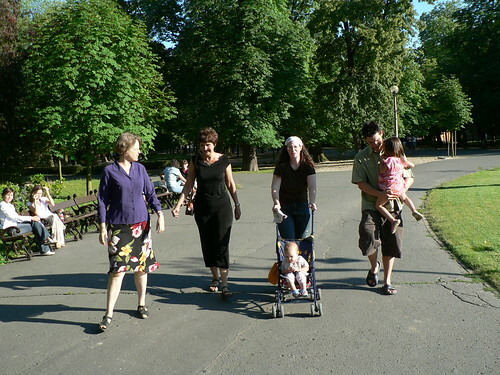 Above L to R: Nina, Kathy, Sharon and one of Kathy's students, Péter holding Elianna. Back to Eger! Eger is where we had our team retreat last week, and our family returned this week to visit an old friend and supporter, Kathy. 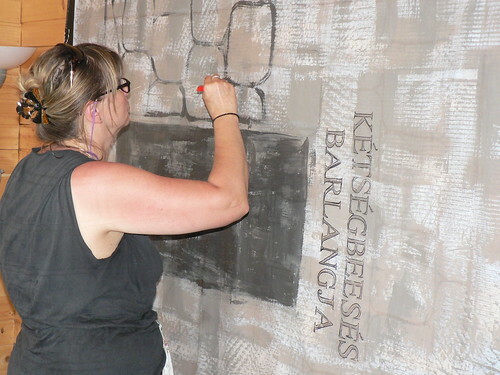 She is serving in Eger on a short term trip teaching English. 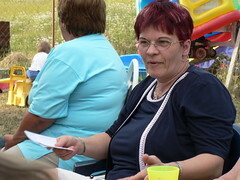 Kathy taught in one of our English camps in 2005. 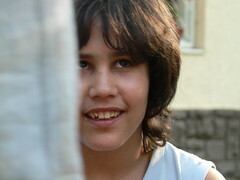 Teenager Zoli from PetÅ‘fibánya happened to be one of her students, and was saved that year. Because of this connection, I decided to bring him along for a 'family' reunion. Above: Zoli being a great 'big brother' to Ben. He was so helpful with the kids on Wednesday. 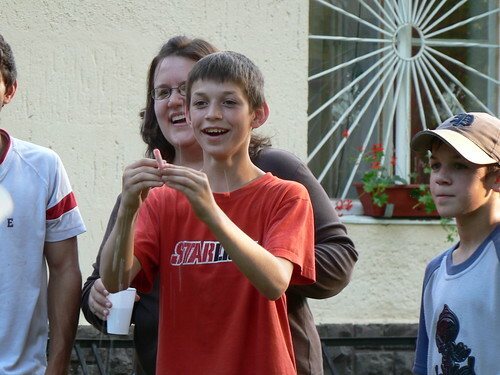 It was encouraging to share with Kathy how teenager Zoli continues to mature in his faith. I also shared how Zoli's mother Ildiko was drawn into our church after seeing the dramatic change in her son's life. 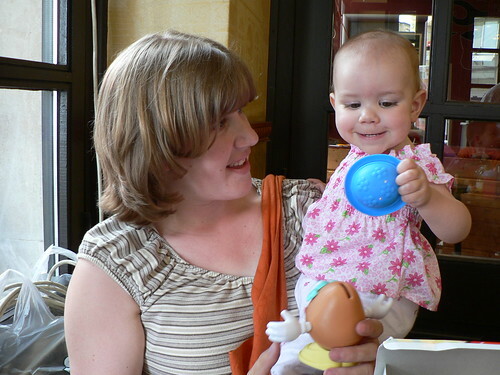 Now, both Zoli's mother and grandmother attend either Bible studies or our church on a regular basis. Our greatest desire is to see entire families transformed by the Gospel and by God's grace it is happening! 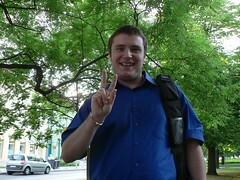 Above: Péter, one of Kathy's students really connected with our family. 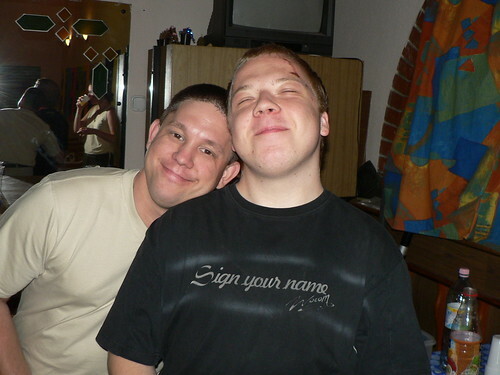 Péter lives in Eger and expressed the desire to meet again. Since we often go to Eger for residency permit extensions and other errands, we hope we will meet again. 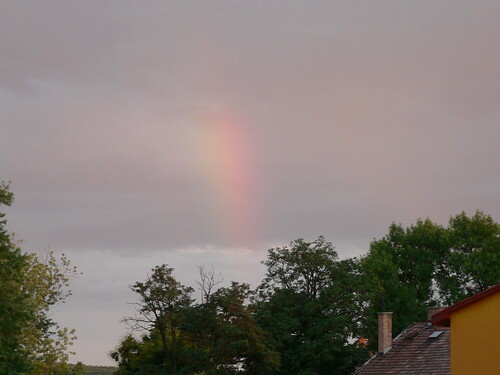 Above: God provides a beautiful rainbow in PetÅ‘fibánya on the way back. On Thursday, I gave DezsÅ‘ a ride into town for a special blessing! 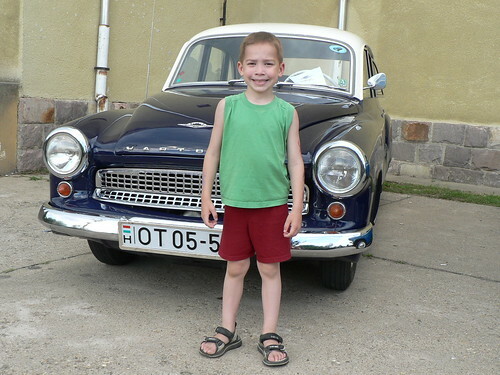 A Pioneers teammate was gracious enough to give DezsÅ‘ one of his vehicles after hearing of DezsÅ‘'s need for a car and his involvement in churchplanting. 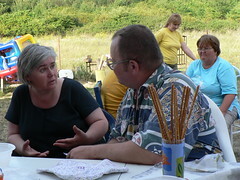 This was a long trip from PetÅ‘fibánya and allowed for very good conversation. 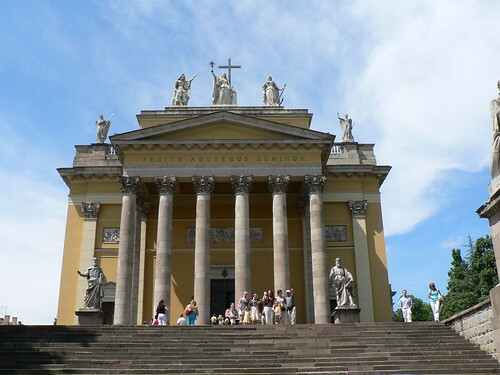 We discussed how grace is missing in much of the teaching of the church in Hungary and how easy it is to slip back into living under the law. It was great to hear DezsÅ‘'s balanced understanding of living out righteousness with full dependence on God's grace. A few days ago in our Pioneers meeting in town, we were discussing what atribute stands out when you think about your relationship with God. 'Provider' is an attribute that always comes to mind for me.God has proven to provide for us in the most difficult times physically, spiritually and financially. Speaking of provision...in this week we have received a multitude of good news regarding various needs. A few weeks ago, we heard about a house for rent that we would be able to use while on furlough in the US for six months. The rent was very reasonable, but we couldn't afford it with our budget. We asked the church board who owned the house if they would consider lowering the rent. After meeting, they graciously approved an amount that we can afford. We sent in a request for a vehicle to rent from an agency that helps missionaries. They recommend that you request a vehicle six months in advance, so we were not quite sure if there would be anything available. God provided, and a vehicle has been reserved for the six months we are in the States. Finally, tonight a gracious supporter in the States has agreed to loan us money to be able to purchase a house in our target area of church planting. This brought tears and praise as we thanked God for His faithful provision and kindness in our lives. Within the past week, God has provided a house to rent in the States, a car to use and now a personal loan to purchase a house in Hungary for life and ministry. Yes, He is a great Provider! Above: On Friday, we had dinner with Edit (left) and her family at Miki's house. We have been seeking to invite a church member or those who are open to God to dinner every week for fellowship. 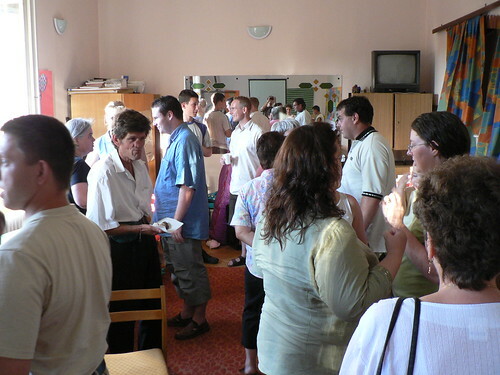 Unfortunately, in larger ministry events we are often too busy 'doing ministry' that we fail to develop meaningful relationships with those who attend. 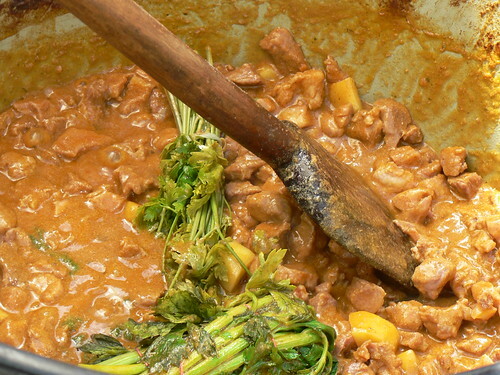 These dinners are a way to truly get to know peoples and more effectively minister to them. 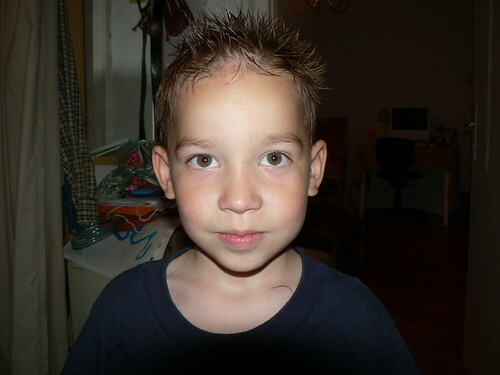 Above: Norbi, one of Edit's four children is Benjamin's best friend at preschool. Above: Sharon talking with Miki's wife Erika. 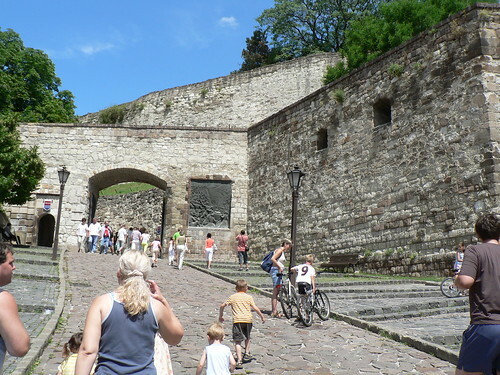 On Saturday, we squeezed into two vehicles and headed for the the city of Eger for a team retreat. 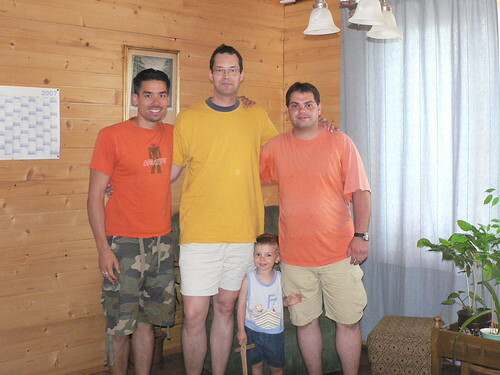 Above: Benjamin, Bence (Miki's son) and Csaba. Above: Cute Kira. We were thankful for the beautiful weather that God provided. Above: A very very very large church building. 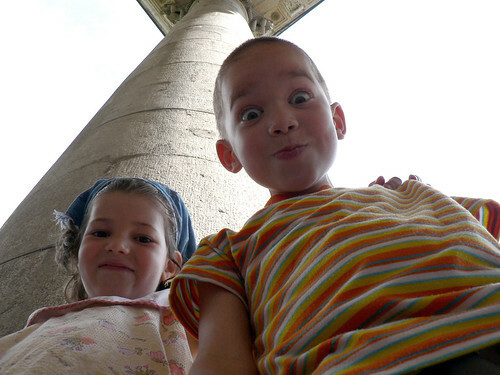 Above: Benjamin and Anna. Who knows where that kid got his sense of humor. 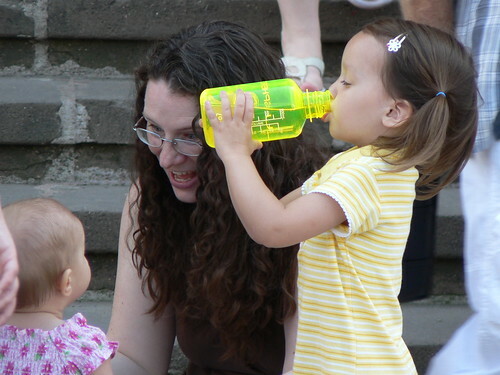 Above: Elianna drinking radioactive liquid...or is that water. 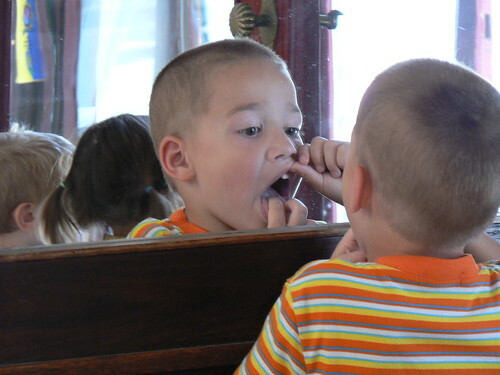 Above: Ben wondering when his other front tooth will fall out. Above: Brothers and sisters in Christ that I am privelaged to serve with in Heves County. 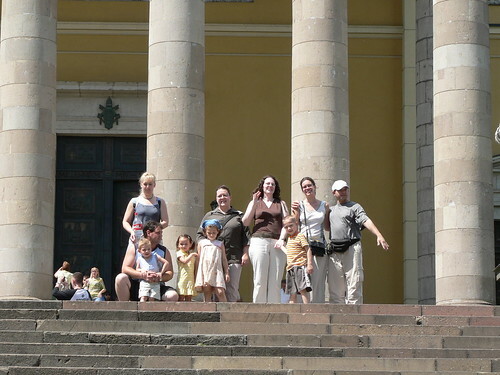 L to R: Janka, Csaba, Erika, Brenda, Miki, Allen Sharon. 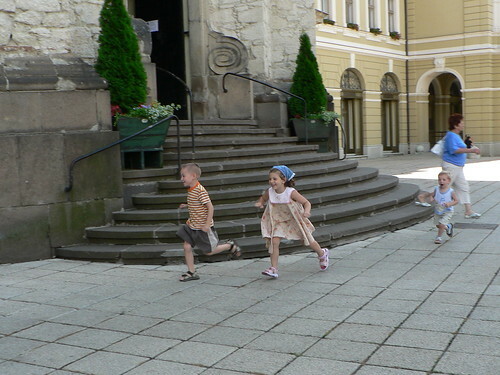 Children: Elianna, Anna, Kira, Benjamin and Bence. I heard a startling statistic before I came to serve cross culturally as a missionary on a team.The number one reason missionaries leave the field is NOT because of culture shock, or language difficulties, or support problems. The number one reason they leave the field is because of problems with other team members. Serving on a team is definitely not always easy, but I believe it creates the best possible environment for growing in our faith and the best means in witnessing to the world. When I think of our team that God has formed over the past few years, I am most thankful for the unity that He has maintained by His grace. Following His lead, we have been able to work through conflict, disagreements and misunderstandings. Instead of giving up on each other, we have matured and learned to love each other. Our team retreat was about remembering and giving thanks for those things which are excellent and praiseworthy. In the midst of ministry and team meetings where we are discussing how to solve problems or increase effectiveness, we sometimes forget to 'think about such things." We discussed how God uniquely called us to PetÅ‘fibánya and how He has since confirmed His calling in our lives. 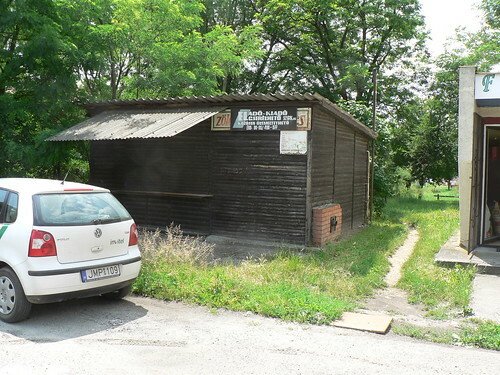 It was comical to hear how the majority of the team initially were completely opposed to the idea of living in PetÅ‘fibánya. Thankfully, God convinced each of us as He spoke through Scripture, prayer, dreams, fellow believers and various circumstances. 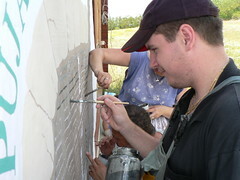 Since that time, we have continued to seek to follow His lead as He builds His church in Heves County. Above: As our numbers have dropped in the summer months, we changed the seating orientation to allow for more personal interaction. After our musical worship, we broke up into small groups for prayer. I was thankful to see each group sharing personal requests and praying for their fellow family in Christ. We also give opportunity for people to share about why they are thankful to God. One visitor shared in tears how she was thankful to God for HIs provision of fellowship. Her adult daughter who suffers from schizophrenia has been ministered to by Miki and Erika as she visits them once a week for Bible study. Peti, who preaches every other week brought an encouraging message on gaining a proper perspective of our redeemed self in Christ, so that we can more effectively love others. 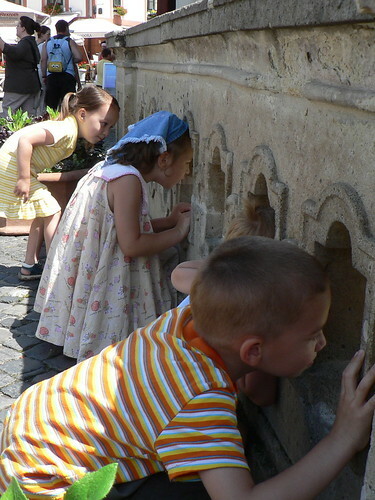 Hungarians, more than many other cultures, often see no value in themselves and are burdened with shame. Above: We praise God for Gabi's graduation! For the past few weeks he has been working hard studying for various final exams. He thanked the church today for our prayers and gave thanks to God for giving peace and help at exam time. 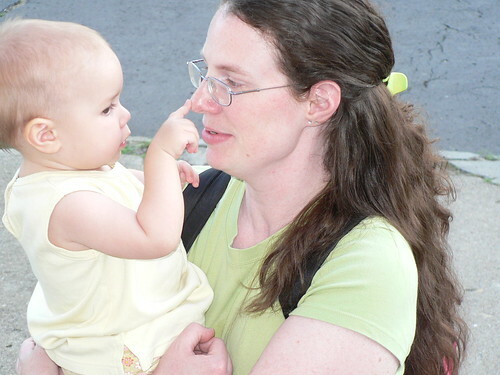 Above: Kira teaching mom the word 'nose' after church. Kira is gaining more confidence walking, but still proceeds with caution. 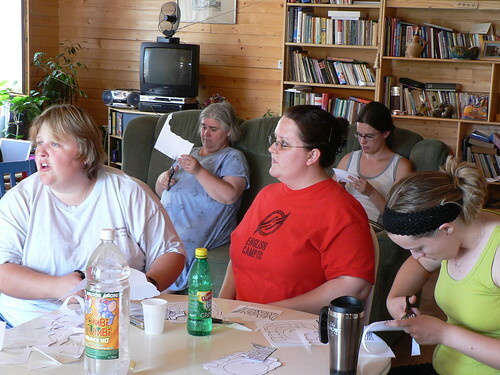 Above: Jenn, Julika, Brenda, Janka and Jenna helping prepare for VBS at Miki's house. 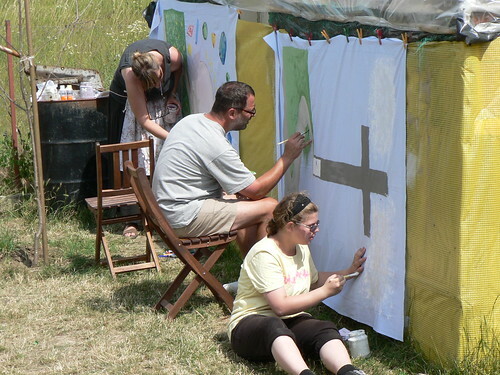 Above: Bearing the 92 degree heat outside, teenager Zoli, Laci and Éva finishing up the last of 6 banners for this year's VBS. 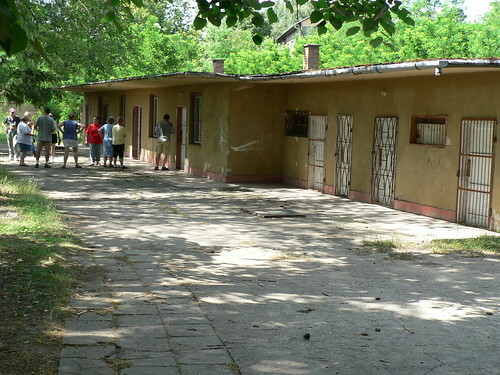 Above: The facility that we are using this year is being given for free by the local government. It is in much better shape than what we used last year and is larger. We praise God for His provision! 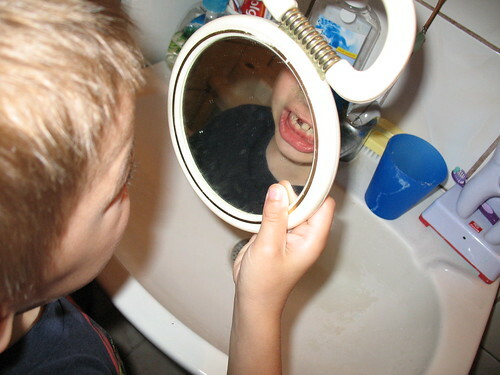 Above: Ben examining the new hole in his smile. Above: We are already busy packing at home as we prepare for our return to the States for 6 months in August. August is still far away, but with two intensive ministries (VBS and English camp) back to back in July and our Hungarian teammate's wedding in August, time is limited. We would like to be completely moved out of our apartment before we return home on furlough. 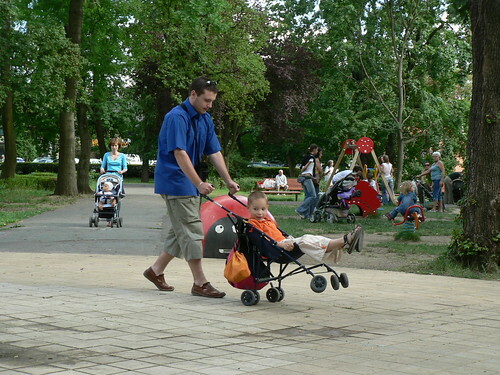 We are looking at housing options in PetÅ‘fibánya since we have outgrown the available apartments in town. Please pray that God would provide according to His wisdom and His will. Tonight, I met with Zoli for our discipleship Bible study. We continue to go through a book which leads us through the Bible explaining foundational truths of our faith. I have given Zoli the responsibility of preparing for the studies and he does a great job facilitating them. He told me that his older brother's girlfriend (who lives in the same house) joined him as he prepared. They read scripture together and Zoli said that he is trying to encourage her in her to change her negative attitude toward God. Zoli and I had an encouraging time of sharing our life with each other and praying for each other. This morning, many of those who will be serving in this year's VBS came together at Miki's house for prayer and a day of preparation. Julika led a devotion reminding us of God's power to provide for all of our needs and his power to equip us to fulfill our calling in this VBS. 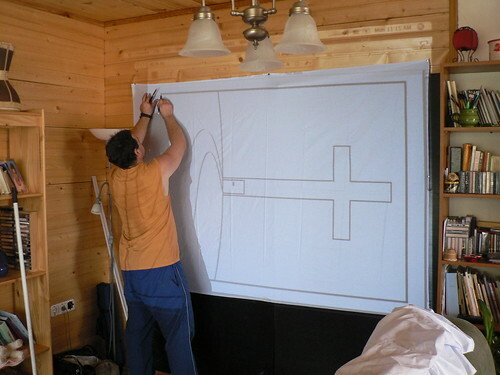 Above: Miki preparing one of the six banners we need to prepare for this year's VBS. Above: Éva, Laci and Mani getting a good dose of summer heat while putting on the finishing touches. 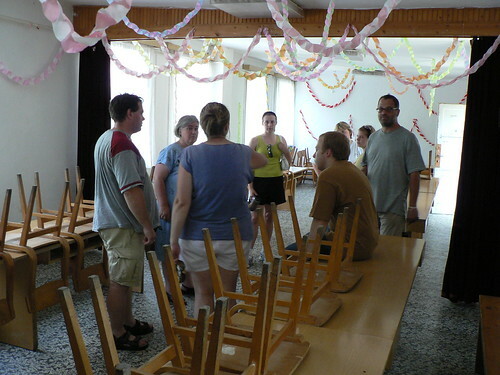 Above: Pioneers team members who serve in different areas of Hungary also came today to help. 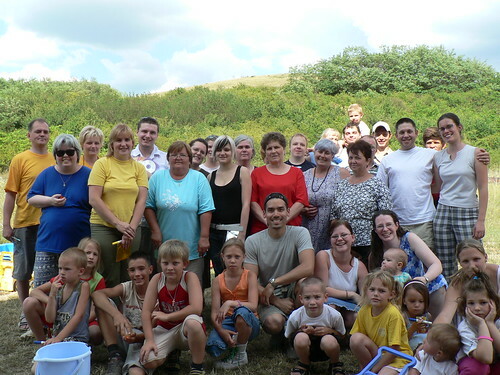 Many of them have committed to help our team by serving with us in this years VBS in PetÅ‘fibánya. We need them! The number of children we expect has raised to 90! We thank God for providing so many helpers. Above: Éva's artistic talents have truly blessed us. 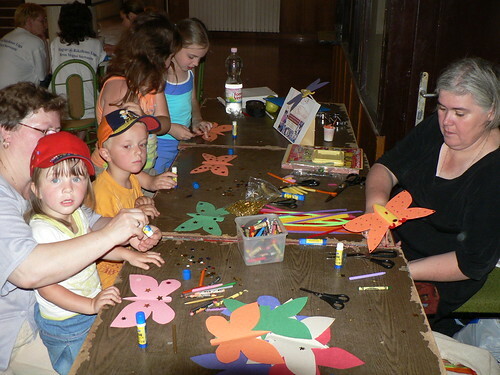 She designed all the banners and has also hand made puppets for VBS. We praise God for the beautiful weather to be able to work inside and outside. We praise Him for giving us success today and for helping us finish the majority of banners. 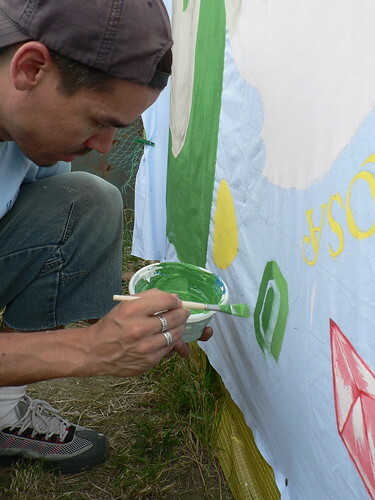 Tomorrow, we will continue preparation of the banners and many crafts materials for the kids. Please continue to pray for us. Above: After a long day's work, it is always a blessing to see smiles and unity in the Body. 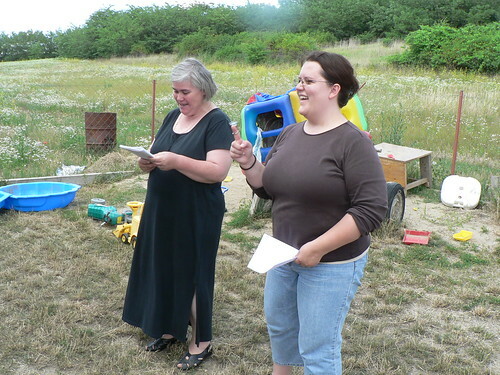 Above: DezsÅ‘'s mom and wife Marcsi helping prepare for today's worship service. Today we had the equivalent of a church picnic at Miki's house. 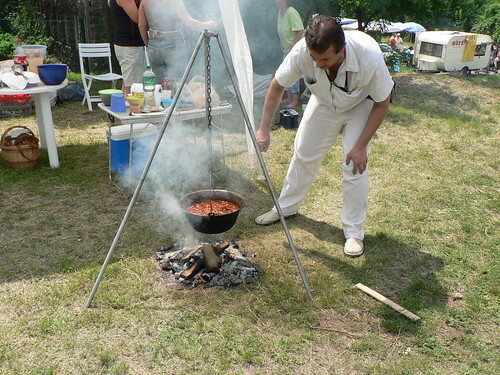 One of the unique cultural activities of those who live in PetÅ‘fibánya is to go for a hike on weekends, set up a kettle over a fire and whip up goulash soup for a meal. This has been a successful tool for outreach and has helped people like Edit (pictured below) step into our Sunday worship service for the first time. 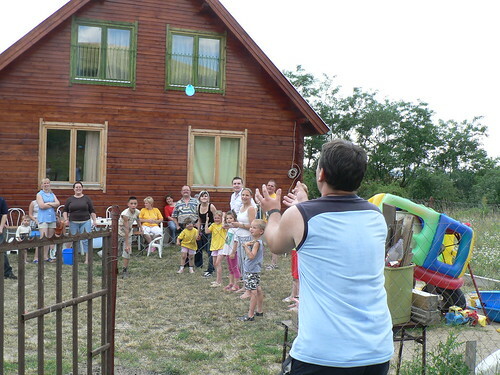 Above: Edit tossing water balloons with her daughter. 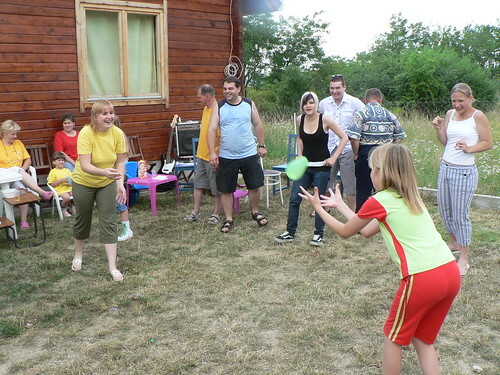 Above: Julika and Brenda led game time and were kind enough to include water balloons in the mix. 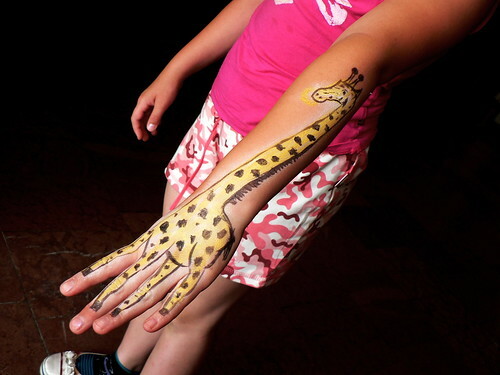 This was a great way to interact with new visitors to our church and led to a lot of laughter. Above: Miki going for the long water bomb toss. Above: I love to see the diversity in age and background of those who have come to Jesus in our church. Above: After game time, we transitioned into our worship service. Zoli's grandmother told me later in our small group discussions how she often finds herself singing the worship songs through the week. They are a true source of encouragement. Our study from God's word tonight was focused on the Biblical meaning of church. Afterwards, we enjoyed goulash soup together and continued our conversation in small groups with questions related to tonight's study. Zoli's mother and grandmother were in my discussion group. 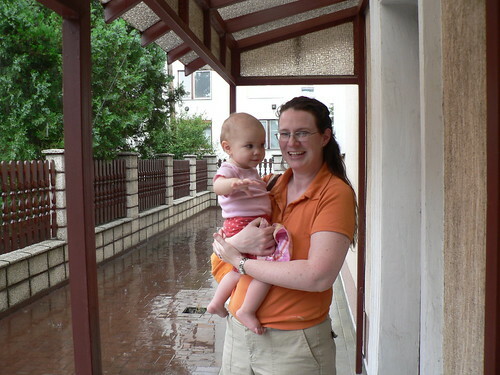 Ildiko began to share how her understanding of church has changed over the past few years. She initially came to our church with suspicion to see what her son was 'involved' in. Throughout the course of a year, after visiting our small groups and seeing real change in Zoli's life, she has grown in her faith in Jesus. Tonight when I asked why church was important, Ildiko said, "It is where I grow in my relationship with Jesus." A guest for the second week in a row, Géza, said that our church is a place where he receives God's grace. 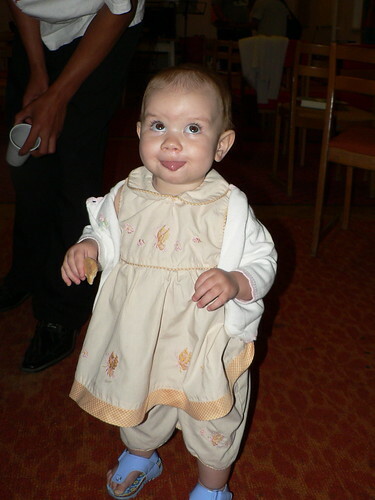 Zoli's grandmother said that she wished she had found our church much earlier in life (since the church is not that old, I don't know if that would have been possible.) 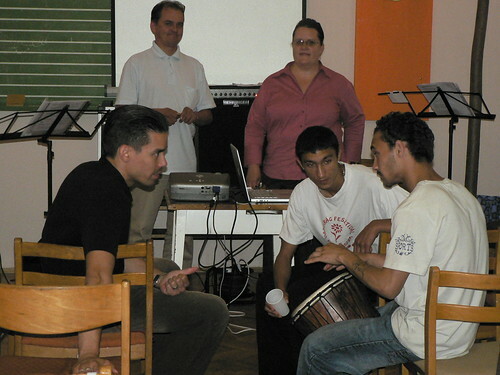 Praise God for His work in PetÅ‘fibánya, redeeming those who have put their trust in His Son. Tomorrow, we ask for your prayers as many of us will be working together painting and preparing for this year's VBS which is 20 days away and counting. The theme for this year's VBS is similar to Pilgrims progress. Please pray for unity, wisdom and strength to complete all that is necessary. We will be working through this entire week to be ready for VBS next month. Above: A summer shower comes in the midst of our trip into Budapest on Tuesday. Allen was in town ordering t-shirts for our team for this year's VBS in PetÅ‘fibánya. We have already been meeting as a core group and continuing to work out the many details involved in planning. 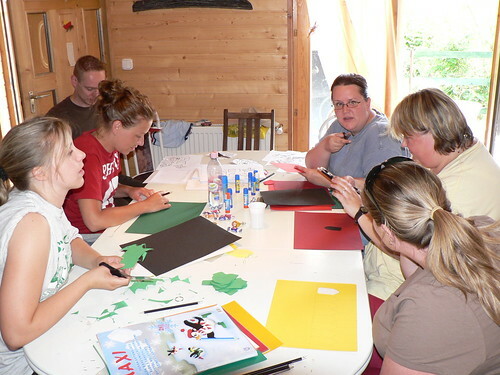 We expect over 80 children this year, some of which will be visiting from Romania. We praise God that we are very close to meeting our financial goal for VBS. The restaurant owner who provided the food last year for VBS is sending his own children this year. He has also reduced the price for each meal and is delivering the food which gives us more time to be with the kids at camp. God is providing already in big ways! Above: On Thursday, instead of meeting with the teens, we decided to join Miki's Bible study group. 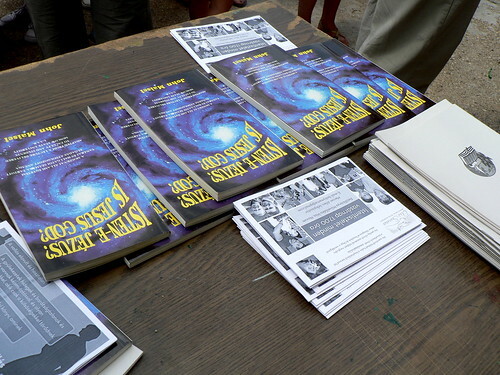 Zoli's mother Ildiko regularly attends this study and God continues to bring proper change to her thinking in light of His truth in the Bible. We studied some truths about end time events and pondered the patience of God in extending grace in order that many more will be saved. 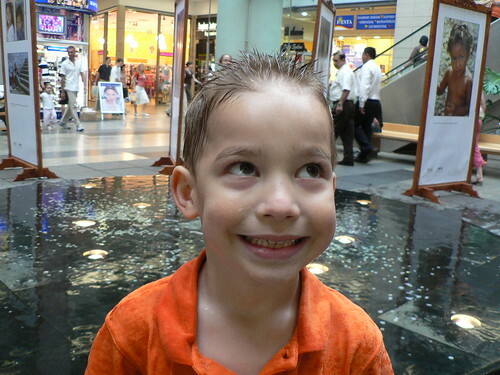 Above: Ben, just out of the bath, with his new spiky look. Just a few days ago, Ben was able to wiggle out one of his front teeth (I will restrain for now showing you the photo). Maybe his new hairdo will distract people from his cavernous smile. Ben and Kira are recovering from being sick with fevers and a sore throat this week. They seem to be doing much better today. Above: On Thursday, we visited the orphanage in LÅ‘rinci. 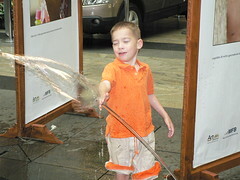 Our son Ben also joined us and had a great time playing with the kids. Above: The weather was perfect to hold game time outside. Afterwards, we held a Bible study and discussed repentance and the Father's readiness to forgive. 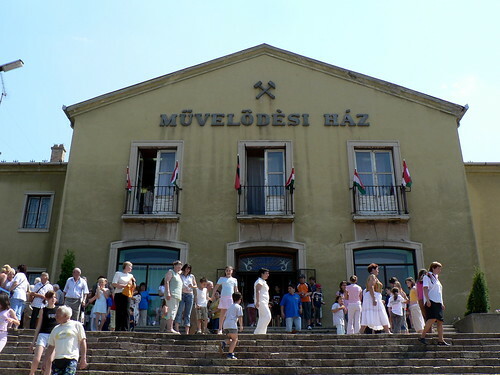 Above: PetÅ‘fibánya's Community Center. 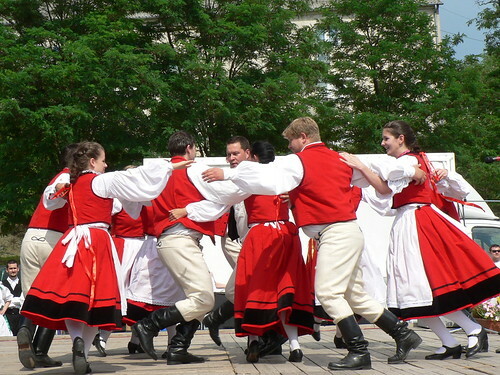 On Saturday, PetÅ‘fibánya held a large Mining Day celebration. 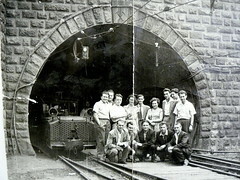 PetÅ‘fibánya came into existence as a mining community in 1942. At some point, years later the mines were closed, but the town continued to grow and find other means of work. 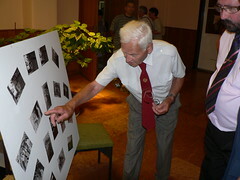 Above: One of the original miners giving details on photos exhibited in the community center. 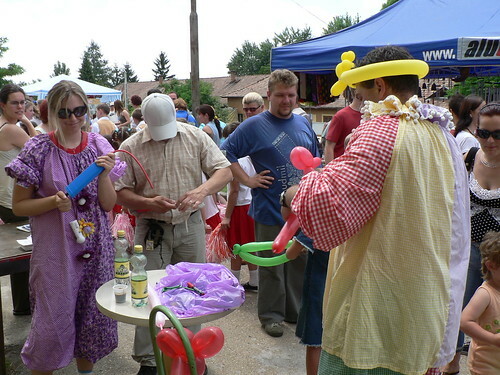 Above: Jenna and Miki were working hard outside distributing balloons, as Csaba distributed invitations to our church. 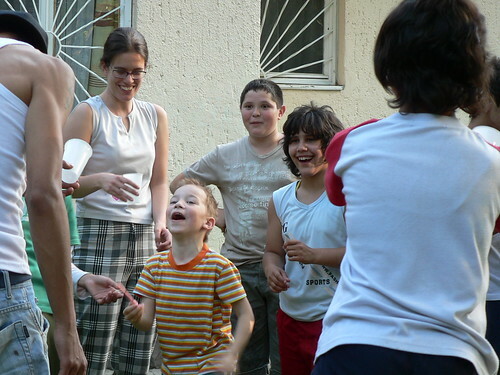 Above: Inside, Julika, her daughter Mani and Allen provided crafts and face painting for the kids. Above: Some other sights and smells from the Mining Day celebration. Above: Tonight, we were thankful for three guests in our Sunday night service. Two teenagers, Ronald and Laci (above) that we have developed relationships through our orphanage outreach came from LÅ‘rinci. An older man, Géza also came after hearing about us yesterday in PetÅ‘fibánya's Mining Day celebration. 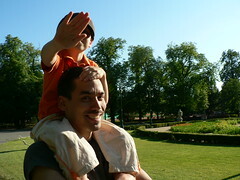 Above: Csaba 'goofin' around' with Gabi. 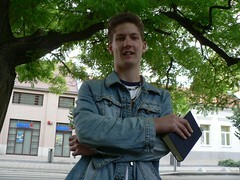 Teenager Gabi S. who recently moved to Sümeg (very far away), traveled to PetÅ‘fibánya to attend church tonight. We were joyful to see him. Unfortunately, on Saturday night, while in Budapest, Gabi S. was attacked in a park when someone attempted to steal his telephone and wallet. He was injured and had to go to the hospital. It seems as if Gabi will be o.k.. Please pray for complete healing of his injuries from this attack. We often give our church members opportunity to share testimony about what God is doing in their lives. Tonight was a bit difficult, but healthy as one member confessed publicly falling back into drinking. After his public confession, we gathered together to pray for him and we hope in God's power working in him to save him from alcoholism. 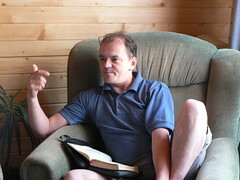 Above: DezsÅ‘ brought encouraging teaching tonight as he continues to preach through the book of Ephesians once a month. 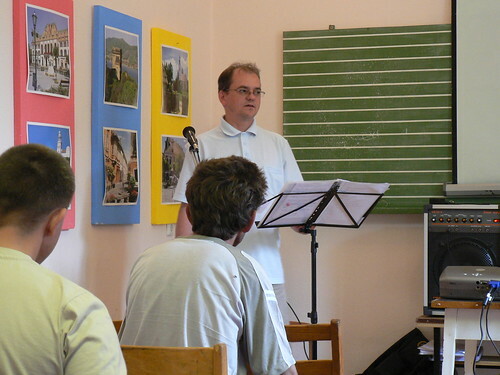 I am thankful to see God's mighty work in maturing DezsÅ‘, and using him to edify the church. 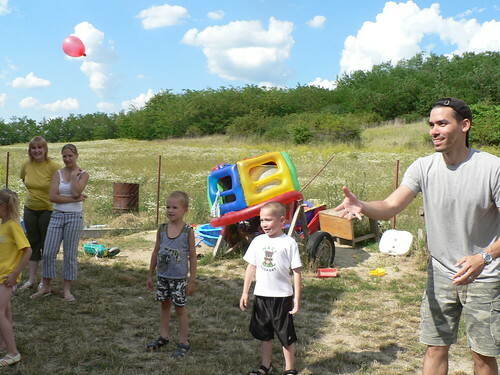 Please pray for DezsÅ‘ and his family as his youngest daughter has chicken pox. Above: Kira. She takes after her father. Above: Allen, Jona, Miki and Miki's son Bence peaking through. On Tuesday morning I had the opportunity to catch up with Jona who leads a church plant in a town just 30 kilometers from PetÅ‘fibánya. Over the years, we have worked together in different ministries and we continue to seek to partner together to strengthen each other's ministries in Heves county. Jona, Miki and I have also begun meeting as accountability partners. I was blessed to spend time in prayer with them. Above: Miki recently discovered an opportunity to buy a plot of land that is located directly opposite of the town's community center. It seemed to be in a great location and for a great price. On Tuesday, we delved into the details, speaking to one of the neighboring shop owners and also to local officials who carry out the selling of the land. It turns out that only businesses can use the land and our purpose would definitely not be a business. As we returned to the neighboring store to discuss the answer we received, God opened up an opportunity to go deeper in conversation with the store owner. It turns out that this man's two daughters attended our VBS last year and had a great time. 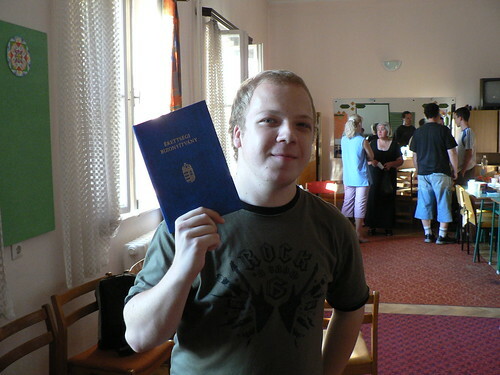 When he found out that I was American and was living in Hungary he was amazed. "Don't you miss home?" "What does your family think?" I soon found out that there was a deeper motivation that drove him to ask these questions. He has a 16 year old son that has a desire to live in America and he is trying to process how to deal with his son's desire to move oversees. Through these questions I was able to give glimpses of what it means to have faith in God, and my desire to be in the center of God's will. Later, his wife walked in and joined our conversation. It turns out that she is the village's social worker and that she attended our ESL program years ago. She said that she missed going to the program and wished that she would have continued. I was glad to be able to invite both of them (and their son) to our ESL program which will begin in September. I was also thankful to be given an opportunity to invite their son to this years English Camp in July. 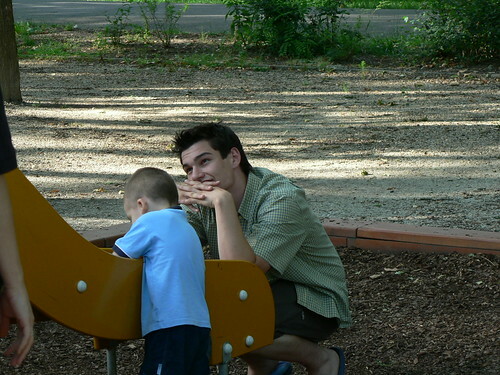 The father is seriously considering this opportunity for his son. Please pray for this family! Miki and I hope to invite them to dinner in the next few weeks to get to know them more. Above: On Wednesday, we traveled into the city to visit a visiting friend (Beth above) and also for Kira's appointment with the cardiologist. 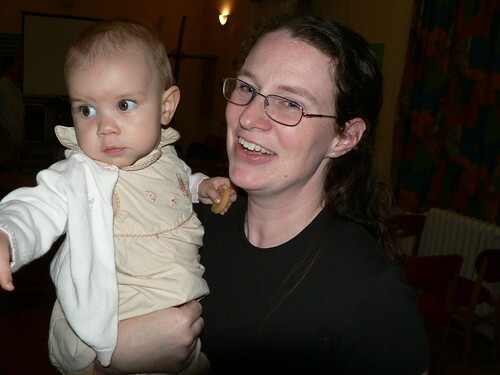 Beth served in an English camp a few years ago in Hungary and has kept in touch. She was visiting Hungary on a short term trip with her school. She was gracious enough to bring a package of Oreo's for the kids, or should I say for Allen. 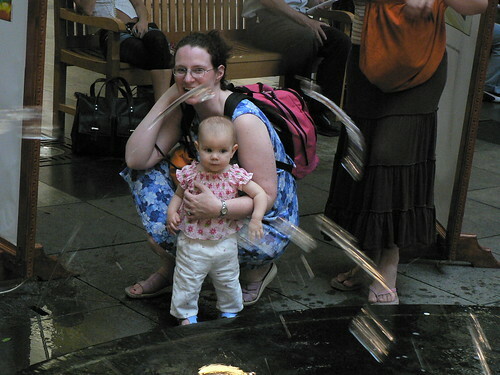 Above: Before going to the doctor, we spent some time at the fountain with the kids. 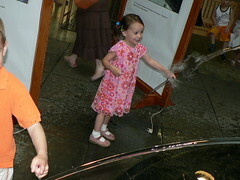 They both got soaked as they did battle smacking the jumping bursts of water. Above: Ummm, mom, I got a little wet. Above: Kira and the cardiologist. Kira still has a mild murmur and two other heart abnormalities dealing with how some of her valves function. 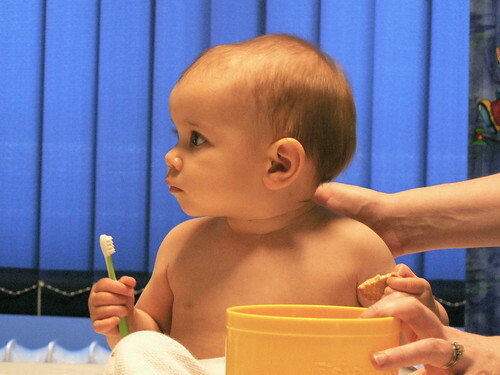 The doctor expects the murmur to heal, and told us that the other issues are NOT cause for concern. 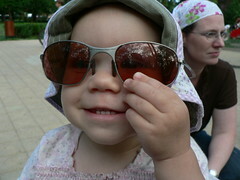 We praise God that Kira's heart is working well, and she is healthy. 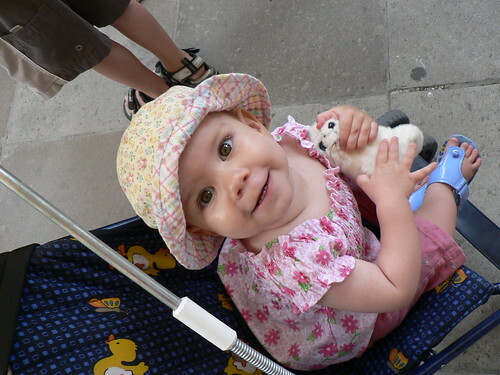 We will continue to take Kira to the cardiologist on regular intervals to continue to keep an eye on her heart. Above: The calm before the storm. Kira was happy as could be until the doctor pulled out the ultrasound equipment. Kira must of had flashbacks of the four shots she received a few weeks back. She was very upset! Afterwards, Kira calmed down and gladly received cookies from the doctor. Tonight our team is visiting the Orphanage in Selyp. Please pray especially for our time of teaching God's word, that the enemy would not distract these kids from hearing God's truth. Discaimer: I forgot to take pictures today. Sorry. I guess you'll have to use your imagination as I describe today. 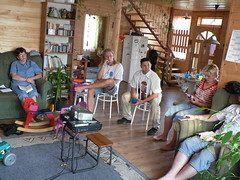 This morning, I headed over to DezsÅ‘'s house for our weekly discipleship meeting. Unfortunately, I didn't confirm our time and DezsÅ‘ was asleep when I got there. Why was he sleeping? Because he just got off his all night shift at work! DezsÅ‘ is on a new shift rotation at work that is grueling. Every seven days, his 8 hours are moved from morning, to night, to through the night. It's like constant jet lag injected into your body. Apparently this is the norm for factory work, and the majority of Hungarians in our area have similar schedules. 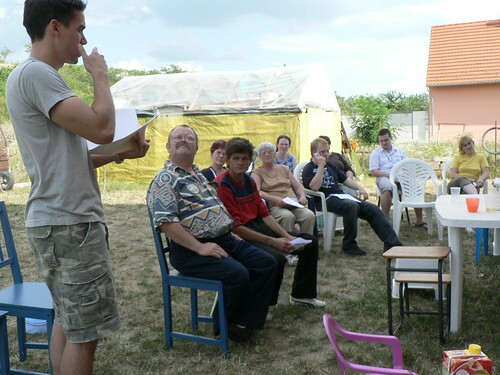 Even with this schedule, DezsÅ‘ helped in a house group meeting in Selyp yesterday, and came to church today by 3:00 for our worship practice and prayer hour with a visible love for Christ and joy to be His. After church tonight, he returns to work at 11pm. Please pray for him to have strength for work, and for wisdom as he prepares throughout the week for next Sunday's message at church. Tonight, we initiated a prayer hour before our church service. We didn't know how many would show up, but we felt convicted that we needed to spend more time as a church in prayer. 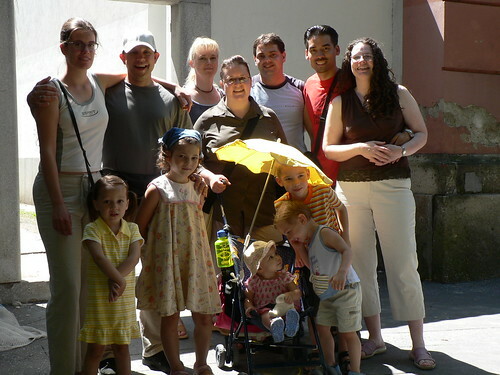 Csaba led the prayer time and Hugi, Lidia, Andi, Laci and Ildiko and the core church planting team participated. It is such an encouragement to hear the hearts of others as we lift up thanksgiving, praise, and requests to God. We hope that next week, our focus on prayer will continue and that more will join us. As our team looks to the future with a desire to empower Hungarians to plant churches, we are constantly examining our ministries, their effectiveness, and also where we need to change. We are in constant need of God's wisdom and direction, and in need of your prayers in this process. Our team also needs your prayers as there are constant challenges and spiritual battles that the enemy uses to distract us from our calling. It would be an encouragement to us if you prayed for our teammates, Miki and Erika, Janka and Csaba, DezsÅ‘ and Marcsi, and Brenda. Thanks for your help through prayers! 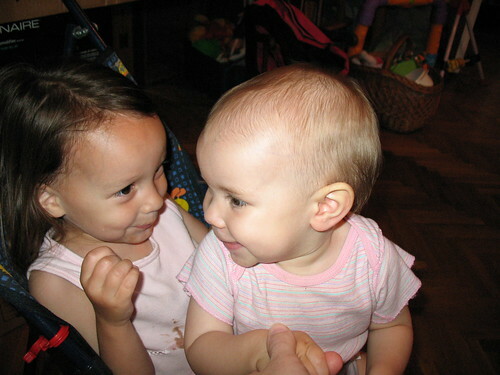 Above: Elianna with her 'Ovi néni' (Preschool Teacher) Ediina. Preschool is coming to an end as summer approaches. Elianna and Ben participated in special 'Year End' presentations for parents. 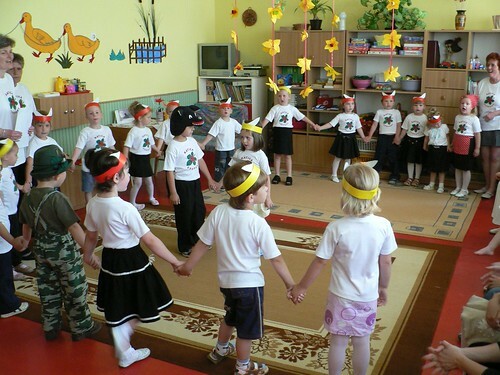 We had a great time watching our kids sing and recite poetry in Hungarian. They are both doing a great job in preschool. As usual, I filmed the shows and will be preparing a DVD for the parents. I also slip an invite to our church into each DVD case. One of the parents that we know from preschool has begun attending Miki's Thursday night Bible study. We hope that more parents will respond to our invitations and gain an understanding of the Gospel. Many months ago, many of you were praying for Feri and his daughter Petra. 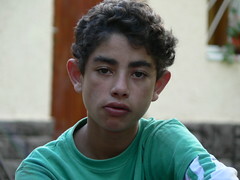 We met Feri in our English program and he is a regular visitor to our church. Unfortunately, his daughter developed a fear of church after seeing a depiction of Jesus being crucified on the cross on TV. She would literally become sick with fear. Because of this, Feri stopped attending and asked for prayer. Last week, Feri came to church, and in the middle of our service when we were in small groups praying, God answered! Miki was in a small group with Feri and praying for his daughter Petra. Moments later, Feri's wife brought Petra to church, because Petra decided that she wanted to attend. She went downstairs with the other kids and stayed until the end of service. This is a huge answer to prayer. Please pray for this family. We hope to be having dinner with them soon to get to know them better. Feri is a Christian and we hope that he will develop a hunger for Christian fellowship that would edify his faith and present opportunity to serve others. 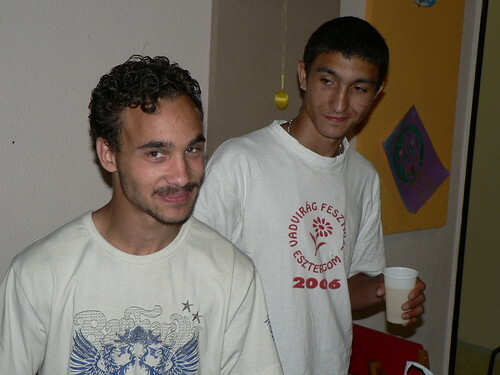 Above: Ádám (L) and Zoli (R). I met with Ádám and Zoli on Thursday for our discipleship study on the foundations of our faith. We learned about the various signs of the end times. After reading the above verse, Ádám's jaw dropped as he realized how accurately this portrayed the current nature of the world. We were encouraged by God's word to be ready for Jesus Christ's coming and to be wise in discerning the deceptive paths the enemy presents in the last days.